Kaldairn advanced flare system that was developed out of the need for smoke free, low radiation flare systems. This flare system incorporates the Coanda Effect which takes place when a gas jet is passed over a carefully profiled, curved surface creating a vacuum. The effect enables substantial amounts of air to be drawn into and thoroughly mixed with the gas flow, resulting in combustion. 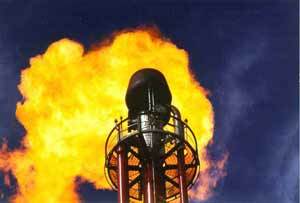 This flare is capable of burning gas from flows as low as purge and as high as 2,000 million standard cubic feet per day. Operating on both high and low pressure gas, it provides low heat radiation and smoke free combustion. A two phase model of the flair is available, capable of safely burning 25% by weight of hydrocarbon condensates. The high gas velocities created efficiently atomise liquids, safely and completely burning away condensates from overloaded knockout drums without causing dangerous burning rain. , 15810 Park Ten Place, Suite 195, Houston, TX 77084. Tel: (713) 492-2262. Fax: (713) 492-2399.